I decided to stamp it on white cardstock with Tuxedo Black Memento ink and colour in the flowers with Copic markers. Once I had them all coloured, I put the cardstock panel back into the Misti (the stamp was still in place from the first time I stamped it), and stamped it a second time, directly over top, with Versamark ink. I then added Wow Silver Sparkle embossing powder onto the stamped image and heat embossed it. I was left with the beautiful colourful flowers with a silver sparkle outline. 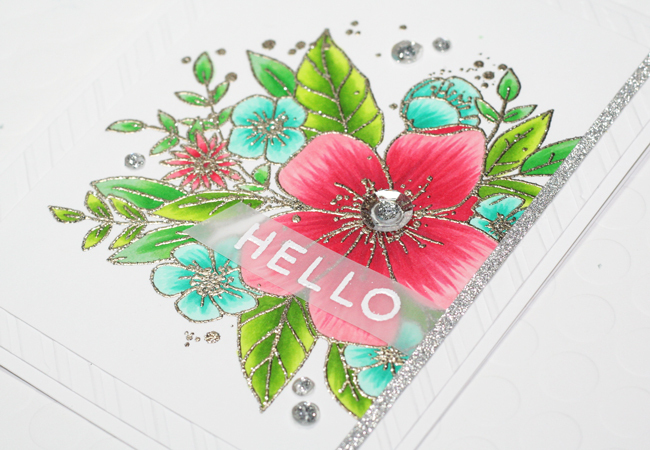 This is my favourite way to combine heat embossing and Copics. It allows me to colour with no worries about damaging my markers and I still get the amazing embossed look when I'm done. Once I completed the embossing, I cut down the panel and adhered to to another panel that was dry embossed with a strip detail. I then added the entire piece to a top-folding white card base. I added a strip of silver sparkle cardstock down the right side and then I added the sentiment (that I had heat embossed with white onto a piece of vellum) directly over the flowers. 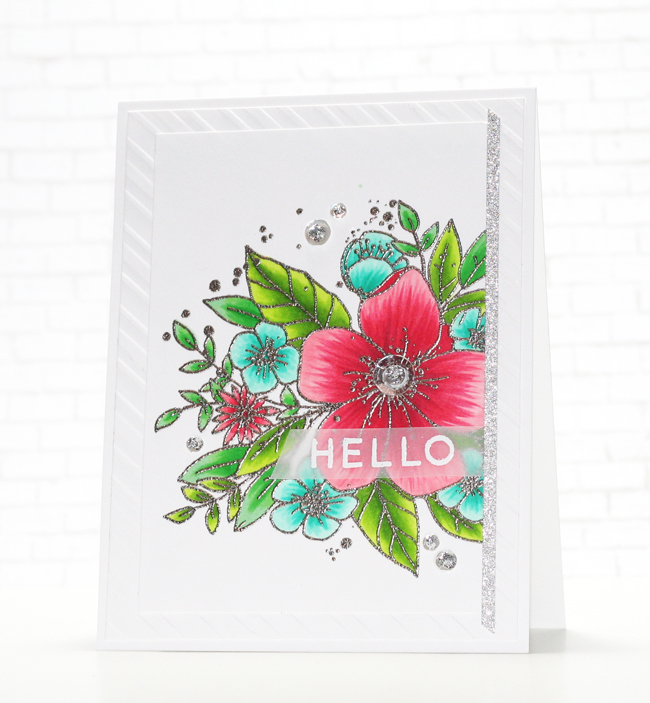 Beautiful card and amazing coloring! The silver outlines make the card so elegant!